All our ships are operated by multi- national seastaff. It is the company's policy to work with a balanced mixture of nationalities onboard and ashore. We have a strict English language only regime to ensure good communi- cations. REEDEREI NORD is proud of its quality international workforce, which maintains and operates the vessels to the highest standards. In recognition of its commitment to its personnel, Reederei NORD won the 1999 Lloyd's List Youth and Training Award. 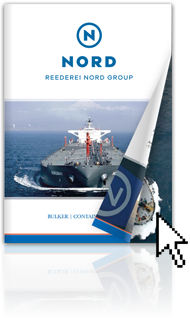 This section is designed to give infor- mation to those seafarers who already work on our ships and to those that may be considering a seagoing career with REEDEREI NORD. Here they will find our company policies, details of our manning agents around the world and information about working and living on our ships.